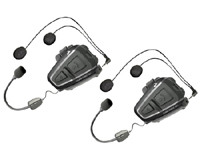 Cardo Scala Rider Q1 Twin Pack (BTSRQ1T) €229.00 - buy online at mysatnav.ie - Ireland's leading GPS & Sat Nav store. 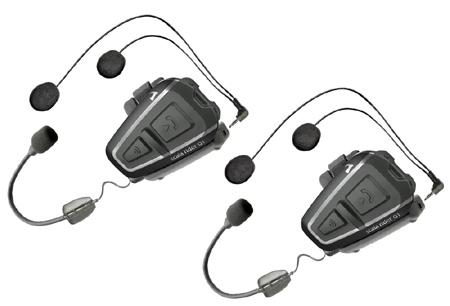 The scala rider Q1/Q3 is an award winning motorcycle intercom Bluetooth communication system. In January 2014, WebBikeWorld, the world's #1 motorcycle website, named the scala rider Q1/Q3 "Motorcycle Intercom of the Year 2013" giving it a coveted 5-Star award. The Scala Rider� Solo Bluetooth� headset is a great solution for the Garmin z?mo and TomTom Rid\er series of motorcycle satellite navigation systems. Motorcyclists can benefit from wireless handsfree communication without compromising security or comfort, thus opening a whole new realm for mobile phone use. The Scala Rider � Solo is a truly innovative, unique and feature rich device, providing safe and convenient mobile phone communication whilst also capable of receiving voice instructions from Bluetooth enabled satellite navigations systems such as the Garmin z?mo and TomTom Rider.